Field Works is a project which explores the potential of site-specific performance and participatory art. Created by Norwegian performer Heine Avdal and Japanese artist Yukiko Shinozaki, the performance is structured in two stations (Field Works-Hotel and Field Works-Office) and was part of the Macau City Fringe Festival and Shenzhen International Fringe Festival. 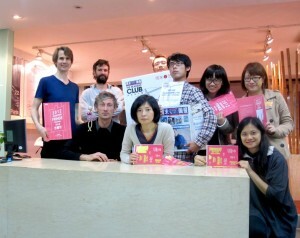 Commissioned by Ibsen International (Norway) for the project Ibsen in China 2012, Macau City Fringe Festival and Shenzhen International Fringe Festival. Another non-place. Inhabited and yet uninhabited. Home for a night. The television whispers to itself. Minibar. Snoring from neighbouring rooms, through flimsy walls. The pillow smells of nothing, the towels are white. Someone else will be sleeping here tomorrow. A hotel room as a place of searching for poetry in everyday life. In their very intimate and playful performances the Japanese artist Yukiko Shinozaki and Norwegian artist Heine Avdal create dream-like, absurd in-between worlds by means of subtle shifts in reality. Only one visitor per performance is sucked into the mysterious past of this very ordinary hotel room: how many people have stayed here? What happened before we came in? Are we really alone, or can we hear the room breathing? Do we remain silent spectators, or will we become a character in a story? This is an intimate performance for one spectator at the time. Duration is 20-25 min and reservation is necessary. In Field Works-office, computers and photocopiers lead a life of their own, and you yourself become part of a fictitious company. In this delightful, almost surreal workshop daily office situations grow into something absurd and unusual. This is a location-based workshop, which unravels the conventions of non-theatrical spaces. In their intimate and playful performances, artists are looking for the poetry of everyday life. In this project they collaborate with sound artist Fabrice Moinet and comic artist/performer Brynjar Åbel Bandlien. Through the use of sound displacements and cartoon like drawings, bodies and actions extend beyond their borders. By small shifts in reality, they create a dreamy, absurd, in-between world, and stimulate our imagination to realise that the ordinary can be extraordinary. After the workshop, office life will never be the same for the participants.